Have you solved yr problem since then??? Searching for working circuits/balance wheel, for a Luch 3055 electro-mechanical. X-have you fixed yr seconds problem? have you solved this? If not, can y define the model of hand-any photo of yr watch?? Have you found the sec hand? Recently i have published a pic of my new -old poljot Amphibia (under title 'June balance:...). This new -old amphidia with relatively damaged dial, has not the original crown and I guess it is not any more amphibian and water tight. Can y have a look at it and can y tell me if the suggestion of changing it by a rusted master means that my amphibian shall be watertight crownwise?? have y repaired it? 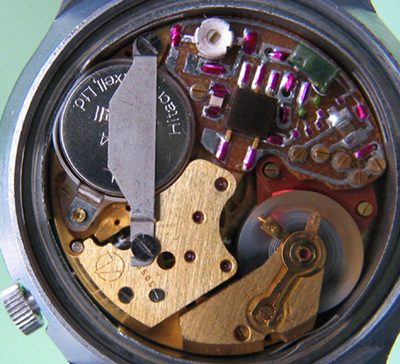 I might be able to find for you a new mechanism or alternatively i could ask for my master to repair yr watch. First alternative is cheaper. Y are looking for a rare bird! Have y found it?? Sorry, I wanted to say y are looking for a very rare feather of a rare bird!. Once I have found one for my strela but i can ask if there is a second to my master. Make yr shopping list in detail and send it to my mail. I believe i can find hands for y but i need full decription of all of them not to find wrong ones. it is worth to send y more than one or two because of postal cost. So please consolidate yr needs and let us cross fingers that my master has stock .